How to Boost Immune System in Children Naturally? Happiness knows no bounds when a baby is born into a family. From the parents to uncle, aunts, and grandparents, it’s one of the most thrilling moments in life for everyone. With happiness, comes stress because of the wish to provide the best to the child in terms of health, education and a happy family atmosphere. Too many illnesses right from the beginning are not very good for the overall physical as well as mental development of the child. A child is bound to fall sick quite often in his early childhood days as his immune system is still in the developing phase. Thus, we all need to know the answer to the question, How to Boost Immune System of our children naturally? The immune system is made up of a network of cells, tissues, and organs that work in coordination with each other to protect the body from various pathogens. Phagocytes- Phage means to engulf as a whole. These are the cells that eat up the disease-causing microorganisms that invade the body. Lymphocytes- they are the memory cells that allow the immune system to remember a previous attack and recognize them in case of a second attack by the same invader. The lymphatic system is the site that hosts most of the cells of immune system. It also consists of lymph nodes that work like filters to remove germs. These nodes are a cluster of immune system cells and are found in the neck, knees, groin, and armpits. A cough and cold are a common ailment that children of various age groups suffer from. Most of them are caused by viruses. As per statistics, an average preschool and primary school child has 3-8 coughs pr colds in a year. A child who lives with smokers has an increased risk of developing coughs and colds. The symptoms include a runny nose, sore throat, raised temperature, pain in the eardrums. It is a misnomer that antibiotics can help to ease the symptoms of cold and cough, Antibiotics do not act against viruses. The symptoms become worse in the first 2-4 days and then slowly die down as the immune system clears the virus on its own. Irritable bowel syndrome is yet another problem seen during the growing years. The large intestine or the colon is a part of the digestive system that absorbs nutrients and water from the semi-digested food coming from the small intestine. Anything that does not get absorbed is slowly pushed out of the body in the form of stool. IBS is not a disease but an aggregation of symptoms that occur together and can make a child feel uncomfortable. If the muscles of the colon do not move smoothly, it can cause stomach ache, constipation, diarrhea along with a feeling that he or she hasn’t finished going to the bathroom and something is trapped inside. The causative reasons are stress, unhealthy diet, eating big and spicy meals. The doctor may prescribe some medicines to manage the symptoms but there is no prevention as such. As growing kids love to explore their world around, they are bound to have cuts and wounds. Most of the wounds do heal up on their own but certain precautions must be taken for the proper healing process. Any break or cut on the skin is a wound as it has the risk of germs getting inside the body and causing an infection. Dirty or infected wounds can lead to an abscess. Sometimes even when the wound is clean, it can be of high risk depending on the where it is on the body. For the first few days of healing, the wound may be red, painful and swollen because of the inflammation at that site. A temporary scab is formed under which the new cells keep dividing, the damaged blood vessels are being repaired and new collagen is being made. Once all this is done, the scab peels off on its own leaving behind a scar which takes a little longer to go away. 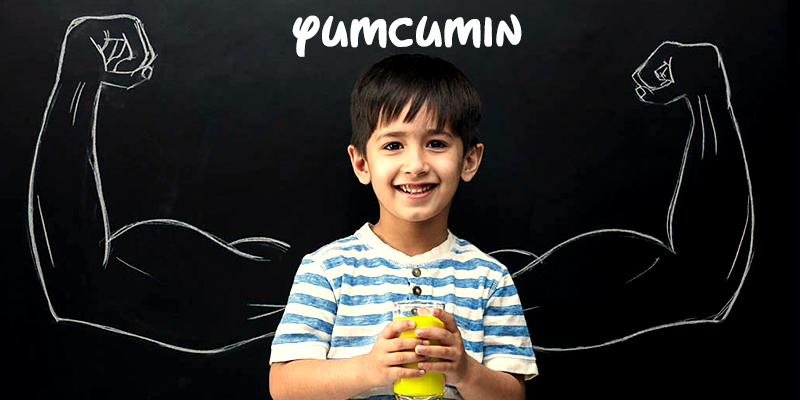 Yumcumin from Bagdara Farms is a product designed keeping in mind all the above mentioned faced by the kids. 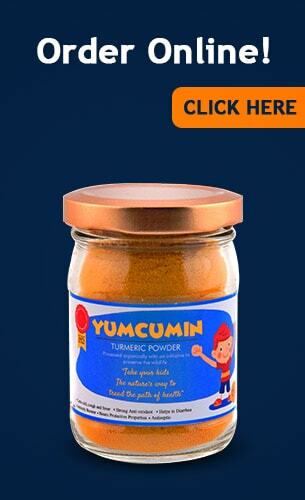 Curcumin and turmerone bottled in Yumcumin has excellent therapeutic properties which are beneficial to the kids. The anti-inflammatory property of curcumin and turmerone can help in the quick healing of wounds and injuries as well as minimizing the risk of infection. The amazing antibacterial and antiviral action of curcumin can help the children to ward off the pathogens and infections that they contract when exposed to several infectious agents through the day. Children who take a regular intake of curcumin are found to be more resistant to cold, cough and seasonal flu. They are also better off in managing the various types of allergic reactions. Oxidative stress that can cause a lot of damage. The antioxidant property of curcumin can help reverse the effects of this damage and promotes healthy growth. Take ¼ tsp of Yumcumin in a cup of boiling water along with a pinch of black pepper and palm sugar. Heat on a low flame for 5 minutes. Give this to the child once a day. ¼ tsp of Yumcumin along with a little bit of ghee together can be given to a child to bring relief from a cough and cold. For diarrhea, add ¼ tsp of Yumcumin and a pinch of salt to a glass of buttermilk. Buy Yumcumin and leave the worry of your children to it.